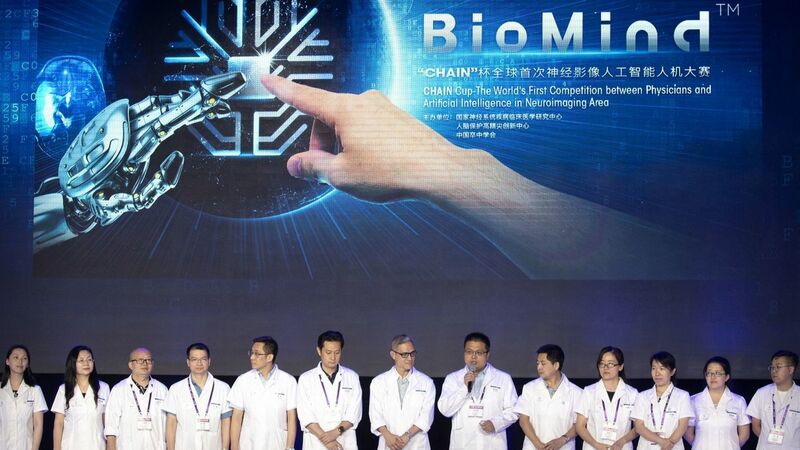 It’s official: on June 30th, 2018, a custom-built AI service with an intriguing name BioMind beat some of the best Chinese doctors in a competition held in Beijing. The system was developed to diagnose and predict brain tumors and hematoma expansion. It seems like its developers did a really good job as the team of 25 highly-experienced doctors from top hospital institutions across China couldn’t help but lose to BioMind with the 2-0 score. The executive vice-president of Tiantan Hospital revealed that due to the rigorous training BioMind became highly skilled in diagnosing neurological diseases such as meningioma and glioma with an accuracy rate of over 90 percent. Impressive as that. The artificial winner was designed by a team from the Artificial Intelligence Research Center for Neurological Disorders at the Beijing Tiantan Hospital and researchers from the Capital Medical University. To make it learn, the AI was “fed” with the data featuring a large number of images relating to various nervous system diseases. And large means large: the collection provided by Tiantan Hospital represents a set of images stretching from a period of over ten years. Returning to the competition itself which was televised on the state TV, the AI system managed to correctly diagnose brain tumors with an astonishing accuracy rate of 87% in fifteen minutes. If to translate those percent into numbers, BioMind was able to properly “decipher” 196 out of 225 cases. The human team wasn’t this successful. Their accuracy rate was slightly over 66%, and they finished the same task in 30 minutes. Let’s keep in mind that the team consisted of elite doctors, not just ordinary staff. As for brain hematoma expansion cases, BioMind correctly predicted 83% of cases, with humans scoring 63% respectively. However, despite such convincing results, it’s too early to believe that AI could take away human jobs in the nearest future. For instance, Cheng Jingliang, a professor of radiology at the First Affiliated Hospital of Zhengzhou University, claims that AI systems in healthcare are “still well in their infancy”. Even though AI is already assisting doctors in reading lung scans, they still not able to provide a full diagnosis to patients, alas. AI-powered solutions may win at competitions, but at the moment they still need human medical professionals to control them. One way or another, healthcare professionals are beginning to actively use the capabilities of artificial intelligence systems. In March 2018 alone, two projects helping to predict the death of patients saw the daylight: a Russian company Gero’s system and the neural network by the IT giant Google. Initially, the United States was the global leader in the artificial intelligence race (just like in many other domains, though). 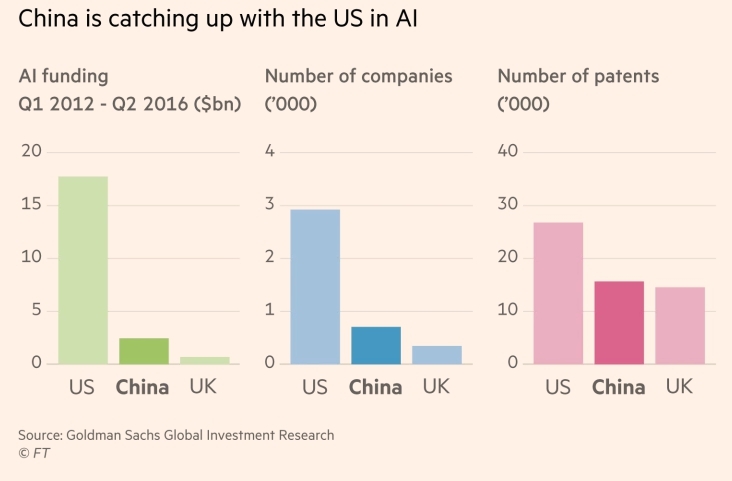 However, over the years, China has steadily gained ground in the AI industry (just like in many other industries, though). he thing is the development of AI has become a crucial part in the government’s Made in China 2025 plan (one should give them credits for a self-ironic title like that). According to the plan, China aims at becoming a worldwide leader in a variety of IT technologies including robotics and AI by 2025. This way, China has become a serious rival for the US. For instance, U.S. Trade Representative Robert Lighthizer stated that “these are things that China listed and said we’re going to take technology, spend a couple hundred billion dollars and dominate the world. These are things that if China dominates the world, it’s bad for America”. In January 2018, the Chinese government promulgated its plans which include the building of a technopark worth $2.1 billion in the suburban district Mentougou in Beijing. The park will be built with a purpose of housing AI research and development-based companies. One couldn’t be more serious. The healthcare domain may have quite a conservative look, but given the information below it’s clear that the industry is switching to innovations. Artificial intelligence is definitely one of these. Even if we might agree with some specialists telling about AI’s “infancy”, no-one сan deny the fact that artificial intelligence has a huge potential to significantly contribute to the development of the healthcare sector, and the results of the competition only prove it.